A discussion on trash pick-up took place at a called meeting of the Dillon County Council on Monday, August 13th. The discussion was initially under executive session on the agenda, but Councilman Archie Scott asked for an amendment to move the debris and trash pick-up from executive session to new business. County Attorney Alan Berry said the reason it was placed under executive session was because there was a desire to receive legal advice on the matter. A. Scott said he opposed this because no one has told him whether there has been a complaint filed or a court order issued on whether the county has committed any wrong doing concerning trash pick-up. He made a motion to amend the agenda which was seconded by Councilman James “Hoghead” Campbell. Councilman Harold Moody asked Berry that since he was telling the council they needed to receive this legal advice in executive session, then where did they go from here. He said they had a motion so what did he recommend. Berry said they could discuss the matter in open session, and then if they could discuss that in executive session. A vote was taken, and the motion passed to amend the agenda. Prior to this discussion coming up on the agenda, the council heard from a citizen, Ronald Crawford, who was also on the agenda and spoke about demolition and trash pick-up. Crawford said he did not know who stopped the trash pick-up in Newtown. He said if any of this mess was going on in your part of town you would be calling to get it straightened out. He asked what was so bad about Newtown that they hated it so much. A. Scott said he didn’t understand the issue. He said that he did know statewide that trash was being picked up on the highway right-of-way. A. Scott said his concern being part of this political body is it there was a complaint filed or if there is an existing court order that would stop them from doing something that they have been doing for some time. He said if those things do not exist, he didn’t see why they should stop picking it up. Campbell directed his comments to Interim Administrator Lisa Gray. He said it was brought to his attention that she stopped the trash pick-up in Newtown. Campbell went to her office and talked about this, and said she did agree that she stopped the trash pick-up in Newtown. Campbell said the problem and concern that he has was that Newtown was his district, and there people put him in his position. “If I am going to sit back and let you or anybody else dictate that they can’t get this trash picked up, then I might as well go home,” said Campbell. Campbell said when they do stuff like that then they need to have a reason why they are doing it. Campbell said he talked with Attorney Berry, and there’s nowhere in the law that says trash can’t be picked up in Newtown on the right-of-way. “So how can we stop it?” Campbell asked. Councilman T.F. “Buzzy” Finklea, Jr., said he thought they were picking up trash on the right-of-way all over the county. Campbell said they were, but they stopped it in Newtown. Campbell then addressed Gray and said he would listen to her about why she stopped it. “It is my understanding that this is not ordinary litter,” said Gray, and that it was not the same as was being picked up along the wood everywhere else. Campbell said they have been picking up trash on the right-of-way since he was a little boy until Gray came and stopped the trash pick-up. “I don’t see how you can single out Newtown,” Campbell said. Campbell said the Sheriff is picking it up every day, and the S.C. Department of Corrections is picking it up every day, but it was stopped in Newtown. “You cannot stop folks form picking up trash on the right-of-way,” said Campbell. Gray said that is why we need our attorney to give us some advice. Berry said he would like to ask a question. He said Councilman Finklea said trash was being picked up in other parts of the county. He asked if they were picking up couches and refrigerators and things the citizens are setting out by the road. Finklea said in Latta, it was mainly papers, wrappers, and bottles. Berry said that was ordinary litter. 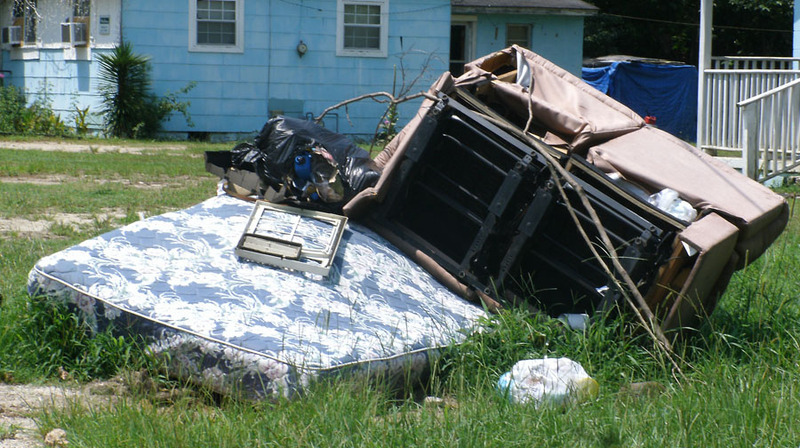 He asked if there was any part of the county that is picking up yard debris or furniture beside someone’s house if they put it out by the right-of-way. Berry said that you can do it if you do it everywhere in the county. “What the problem?” Campbell asked. “You will be broke in three months if you start doing it,” Berry said. Campbell said these councilmen up here have a right to pick-up trash in their district. Berry said that they have a right to vote to do that. Campbell said they had done that. Berry said they had no done that—not to pick up trash. Campbell said you can’t define trash. Berry said that oh yes you can. Campbell told Berry to show him that in that statute. Berry asked if Campbell was asking him for a legal opinion. Campbell said he wanted him to show him that the statute where it is against the law. “I’ll get Judge Burch to show you,” Berry said. “Show me the law,” Campbell said. Berry said before they decided what to do; he thought they needed to discuss it in executive session. Berry said before everybody goes too far, he said they need to think about this matter a lot more than they are thinking about it. Campbell said it he can’t show him the statute, how they violated the law. Berry said there was no statute that it relates to Judge Burch’s order (which council members were served with at a previous meeting). Campbell said he knew that Judge Burch couldn’t tell him that it was against the law to pick up trash on the right-of-way. More discussion followed of the same issues. Berry said it was his understanding that the trash pick-up stopped at the advice of a previous county attorney. He said it started back with Hurricane Matthew when an emergency ordinance was passed, and it never stopped. Campbell asked if anyone had been to Newtown and seen the trash beside the road. Gray said she had. Scott said that they have no opposed anyone who wanted trash picked up anywhere in Dillon County. Gray said it was brought to her attention that his was being practiced and because of the many years that she has worked for the county, she has been in conversations where this has been addressed. Gray said when the solid waste issue came up, the county had to come up with some means of handling solid waste in a different manner. Gray said the council at the time went with the convenience sites in various parts of the county. Gray said the system they went with was on that everyone in the state agreed was a great system and the most efficient way to handle solid waste. She also mentioned the ordinance passed in 2008. “With all due respect, Mr. Campbell, that is not true.” said Gray. “I can’t let the people in my district suffer and not speak out about it,” Campbell said. Campbell said again that he and Berry had talked about whether it is legal to pick up trash on the right-of-way. Campbell said when the people got caught doing it there was a litter officer to charge them, but “if there is trash on the right-of-way, they’ve got to pick it up. Campbell said the City of Dillon had trash trucks to pick up trash in the city. Chairman Stevie Grice said that the residents of the City of Dillon pay a fee for it too. Campbell said he understood that. Councilman Gerome McLeod said he paid $25 a month to get his trash picked up in the city. He said if they citizens need trash pick-up then they need to look at some momentary needs to add in if that is the case. Berry said if they do it they have to do it everywhere. To watch the video of this meeting, visit The Dillon Herald’s channel on YouTube.